The Finance Dashboard is an interactive application demonstrating the capabilities of Infragistics Data Chart and Tree Map controls applied to the Financial Services industry. The Stock Chart view of the application is built using the Data Chart, which has been optimized for high speed financial charting. The Data Chart supports large datasets with millions of data points and real time updates. 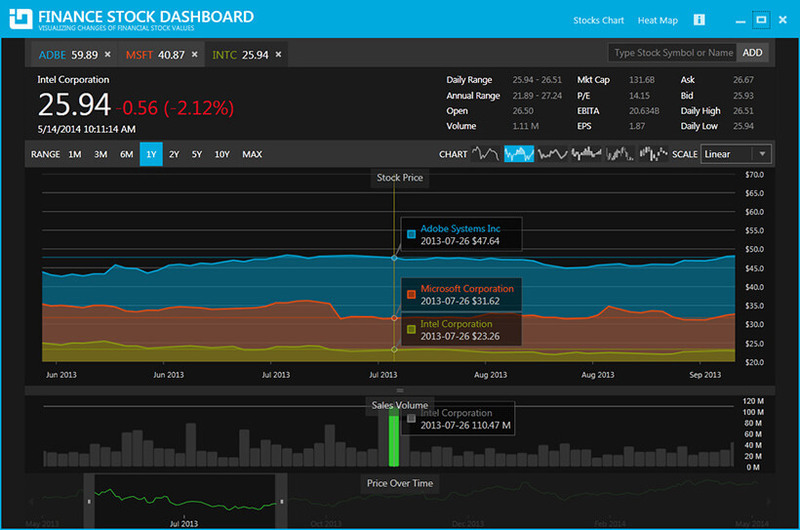 In addition, this control enables key statistical and technical indicators as well as comparisons to key competitors. Viewing options include 1-, 3-, and 6 months, 1-, 5-, and 10 years, and "Max" with zoom bar. In addition, the comparative analysis charts a company stock price with key competitors. The new Heat Map view uses the Treemap and Grid controls to visually represent the current state of the Market in a space-efficient layout. Real-world applications of this sample may include inclusion into a line-of-business application or an external customer-facing application.